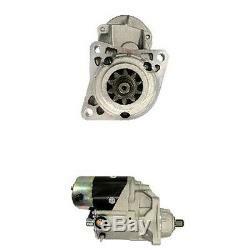 One New Aftermarket Replacement Starter made to fit Bobcat Skid Steer Loader Model: 751C. Bobcat Loader Model: 873C Replaces Part Numbers: ELS60-0126, 6665654. Reliable Aftermarket Parts is in not affiliated in any way with OEM manufacturers. We also carry replacement parts for the Boom Cylinder (Seal Kits, Tubes, Glands, Pistons, Rods). The item "6665654 Starter Fits Bobcat Loader Skid Steer Loader 751C 873C" is in sale since Friday, September 4, 2015. This item is in the category "Business & Industrial\Heavy Equipment, Parts & Attachments\Heavy Equipment Parts & Accessories\Construction Equipment Parts". The seller is "reliableaftermarketpartsinc" and is located in Williamston, Michigan.